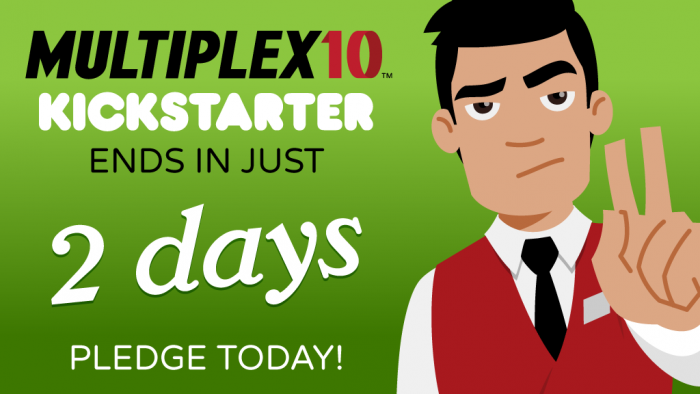 The Multiplex 10 Kickstarter project ends in TWO DAYS. (Sunday, May 7th, at 11pm Central, to be precise. Kickstarter rounds down.) Right now, we’re thisclose to $17,000 — nearly 40% of the way to our first and only stretch goal (so far). I wanted to help encourage a few Multiplex readers who loved the webcomic but haven’t pledged to support the animated short yet with a new reward on the existing $20,000 stretch goal: a Multiplex 10 comic ebook — free to all $25+ Kickstarter backers. I’ve run a few “story comics” over at the Multiplex 10 site (two of which also ran here), and I will be a few more of those no matter what, but this stretch goal/reward will add even more new comics and make the ebook into essentially an “episode zero” of the animated series. It will be at least 16 pages long, with the existing comic strips and new material slightly reformatted into a single, continuous story rather than a collection of comic strips like the Multiplex Chapter eBooks. Oh, and by the way: Book Three is IN! And I have the first box of rewards packages ready to ship out today. The “regular edition” books will go out first, because they’re the easiest (and clear out my overwhelmed office faster); the artist’s edition books (with sketches) will take a bit longer. For those of you who didn’t back the Book Three Kickstarter, the BackerKit pre-orders are now closed, but it will go up on the Multiplex store next month, after all of the Kickstarter rewards are fulfilled.